AFC Fylde manager Dave Challinor has added to his squad with the loan signing of Manchester United youngster Tom Sang. 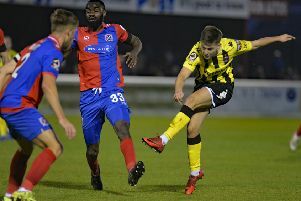 The highly-rated midfielder has penned a loan deal until the end of the season with the Coasters, having signed a new contract with United in May last year. The 19-year-old, who can also fill in along the back four, has played for United’s U23 side and in the UEFA Youth League. He was also called up for first-team training last October by former United manager Jose Mourinho prior to their Champions League fixture with Juventus. “He’s a young player who’s been with us a couple of days and United were good enough to let him come along and get acquainted with us, and vice versa,” said Challinor. “The big thing with Tom is he gives us options; he can play as a defensive midfielder, as a full-back, or as a centre-back if we need him to. Sang will be available for Saturday’s FA Trophy trip to Ramsbottom United.